The Dance Mob (formerly known as the Flash Mob) is a fun and easy dance created by local artists and performed by the community. No dance experience is required and all ages and abilities are welcome. You can learn the moves from the instructional video (embedded below), or at one of our workshops (listed below). Then come down to our Community Showcase in Ivey Park on June 30 at 6pm and dance with us! 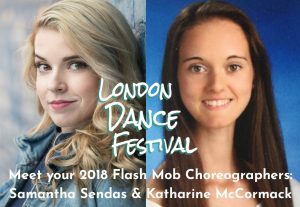 The Dance Mob choreographers Samantha Sendas & Katharine McCormack will be touring the city in June teaching the dance to Londoners of all ages. Want them to stop at your school, business, or organization? Email us at LondonDanceFestival@gmail.com to book a FREE workshop. No experience required, all welcome. June 30, 4:45pm Ivey Park (331 Thames St) OPEN TO THE PUBLIC – and your LAST CHANCE! 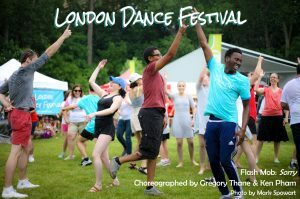 Learn the moves, then come dance with us in Ivey Park at 6pm on June 30! Watch the 2017 Flash Mob, created by Greg Thane and Ken Pham. The rain didn’t dampen our enthusiasm!